Please check your audio and MIDI settings to ensure you have a valid audio and midi device selected. 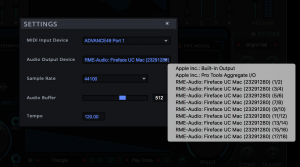 If you are working within a DAW, go to the Audio/MIDI settings of your DAW and select an audio output and MIDI input from your list of devices. If you are working within the Standalone application, you can find the settings window by pressing the setting icon located near the preset selection of your plugin. The icon will look something like this. After clicking on the settings button you will be presented the settings window where you can select your audio and midi devices. It looks like this. Note, 2getheraudio plugins require an ASIO compliant driver on Windows.